If you were lucky, the castings were OK and the transom pintle did not break while you were planing at speed. 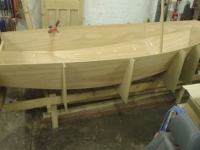 You will also have to fit the rudder pintle on the rudder assembly, but this is done in conjunction with the fitting of the transom gudgeon and pintle which are fixed up the vertical centre line of the stern post (Plate 58). 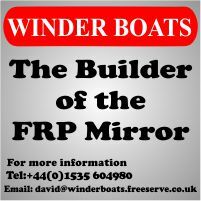 The positions are as follows:- there must be 9" between the BEARING SURFACES of each pintle and gudgeon whilst the transom pintle is fixed to the aft transom with its bearing surface 10 1/4" below the top edge of the transom. The most important point is that the rudder eventually sets vertically on it's bearings and arcs freely over a complete half circle. To simplify matter you can partially fix, BY JUST ONE SCREW, each metal fitting in its respective position and thus you can make slight adjustments to achieve the perfect positioning before the final fixing. * N.B. Rudder fittings will now be supplied in stainless steel unless otherwise stated. They are not compatible with the original aluminium alloy fittings and holes in the new st. st. (stainless steel) transom fittings do not line up at all with the old ones. 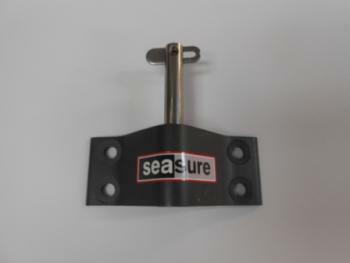 Subsequently rudder fittings have been made from either stainless steel, or extruded aluminium alloy body with stainless steel pintles, such as this one from Seasure. The vertical transom doubler inside the aft buoyancy tank (which is what the transom pintle is fixed to) is 88mm wide, so this needs to be borne in mind when selecting a transom pintle. It's easy to bolt, rather than screw, the transom gudgeon on, which is much more secure, praticularly on a 'racing' kit/boat with an obeche horizontal transom doubler. 1.5.2 Two rudder pivot fittings shall be fitted on the aft transom the bearing surfaces of which shall be not less than 200mm apart. One rudder retaining device shall be fitted. 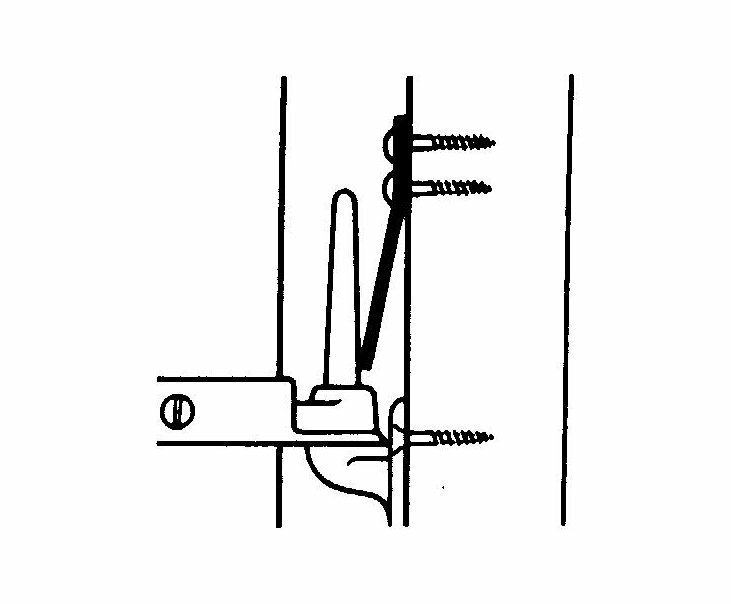 This is screwed to the transom as shown in the diagram and you will see that in operation, the lower edge of the clip rests above above the lower rudder gudgeon retaining the whole rudder assembly in place. To remove the rudder it is only necessary to depress the leaf spring and slide the gudgeon past the fitting. 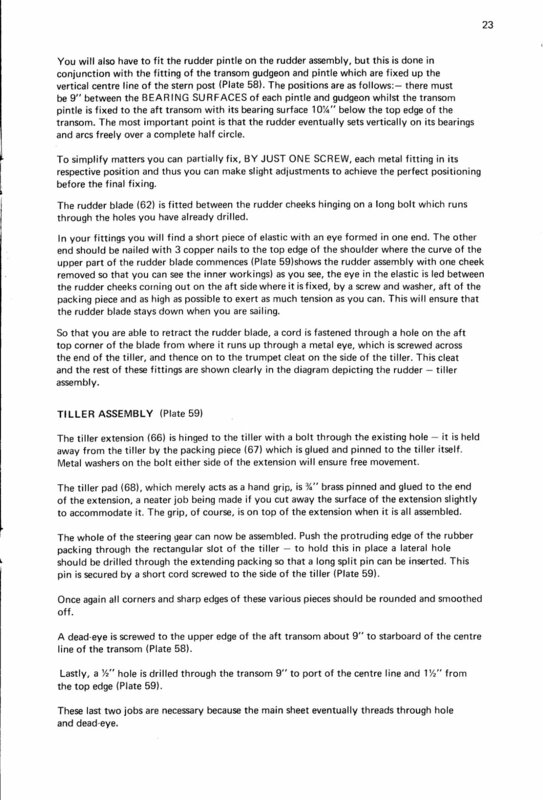 The rudder retaining clip (the Holt Allen HA21 was the fitting supplied with the kit) is an important safety feature. If the boat capsizes, it is important that the rudder remains in place so that the boat can be sailed after it has been righted. Some modern rudder fittings incorporate a rudder retaining device, such as the drop nose pin on the Seasure 18-14DL, which means you can dispense with a separate fitting. 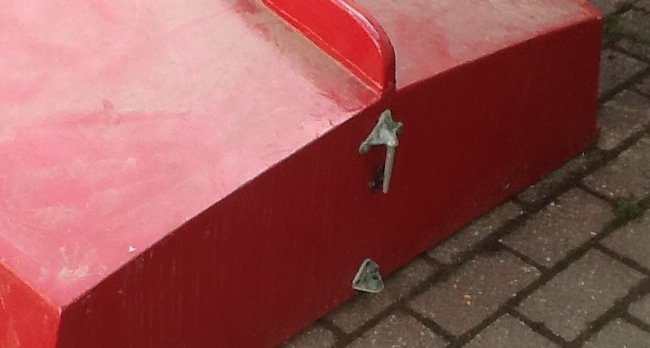 3.03.2 Unless the rudder box or stock is securely fastened to the hull, the rudder pin or pintle shall be fitted with a stainless steel retaining pin such as to prevent the rudder/s becoming detached. So if you sail, or are going to sail in Australia, a rudder retaining clip is no good, you need a retaining pin or clevis ring on the pintle.